In California, summer has been stubborn and clingy, unwilling to give way to the freshness of fall. Again this week, the temperatures have risen into the high 80s and 90s. And yet like magic, the wind blows and the leaves swirl on the driveway in that familiar autumn pattern. In late September, I was just as stubborn and clingy about transitioning into fall food. I was a special guest at an auction-winning dinner party and was charged to bring appetizers to serve and discuss. I vacillated for days about what to prepare, in part because of my own time restrictions, but also because of the weather. The holidays (Sukkot in Judaism welcomes the fall harvest) and the calendar date said we should be eating fall fruits and vegetables. 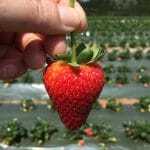 The sunny warm weather still echoed thoughts of berries and tropical fruits. The recipe for the soup came from a wonderful cookbook by Maria Speck called Ancient Grains for Modern Meals. It incorporates ground-up oatmeal in the ingredient list – a unique way to create a wonderful texture in the final product. Here’s how the soup came together. 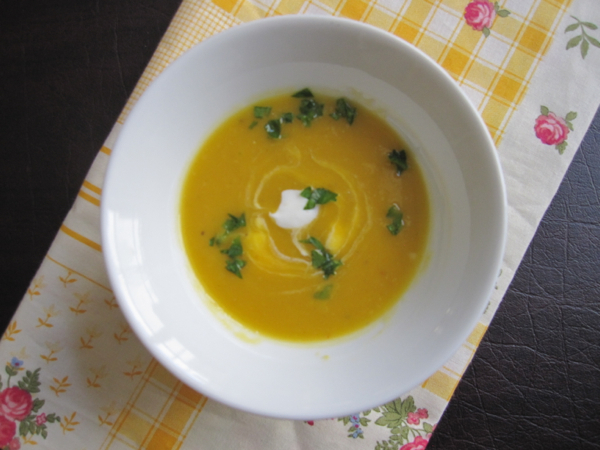 In Maria’s book, it’s called Acorn Squash Soup and calls for a whole acorn squash, to be peeled and chopped. At my local New Leaf grocery store, the produce manager offered to cut the squash for me but also recommended another type of squash and suggested an alternate cooking method. 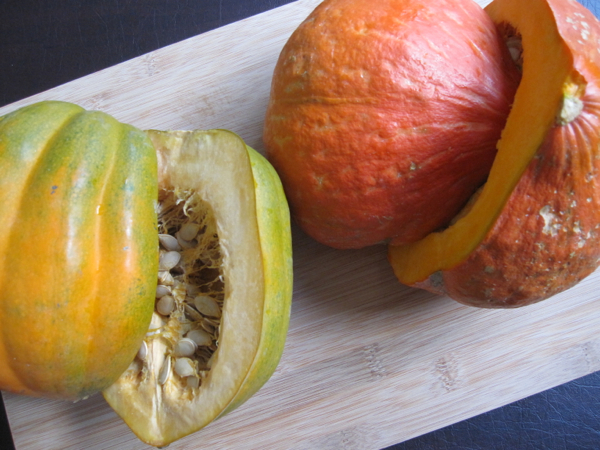 She introduced me to red kuri squash – a beautiful orange red flesh and mild sweet flavor. So I opted for one red kuri and one acorn. 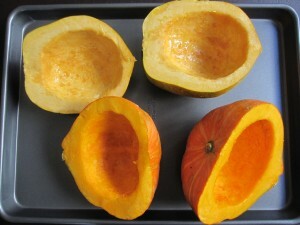 And she suggested I roast the squash, rather than peel and dice – a time saver and arm saver and so simple to do. I roasted the 4 halves of squash, just brushing the outside with some olive oil and putting a bit of water in the sheet pan while it cooked. The flesh was soft in 20 minutes for the red kuri and about 30 minutes for the acorn. While the squash cooked and cooled, I prepared the other items for the soup including grinding the oats, sautéing the onion and preparing the spicy lemon yogurt sauce. Once cooled, I scooped out the flesh and then added it to the soup, let it cook for about 10 minutes, then used a hand blender to puree it – all along tasting for spice, salt, and pepper. I let it cool, packed it away in a container and was ready to reheat and serve it the next day. And what about those oats in the soup? Well, without any cream added to the soup it had a velvety texture as well as a little extra nutrition from the great grain. 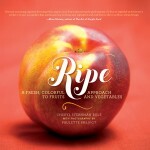 Just one of many creative, nutritious, and delicious recipes in Maria’s award-winning cookbook. I heartily suggest purchasing the book and heading over to her web site to learn more about her unique background and creative cooking techniques. All three appetizers were devoured at the dinner party with second “shots” of soup requested by almost everyone. Last Thanksgiving, I prepared a Bobby Flay recipe of Pumpkin Soup with Cranberry Maple Crème Fraiche. Even the doubters in the crowd, loved the soupy interlude before we sat down to the main course. Here’s to the late arrival of fall and all its glorious bounty! What is your favorite fall food? Use this fabulous recipe as a springboard to try other squashes. Adjust the spiciness up or down in both the soup and the yogurt topping to please your palate. The oatmeal gives it a rich, velvety feel in every mouthful. If roasting the squash, rub the flesh with a little olive oil, place it on a sheet pan with a bit of water and roast it at 400 degrees for 20 - 30 minutes, until a knife easily passes through the flesh. 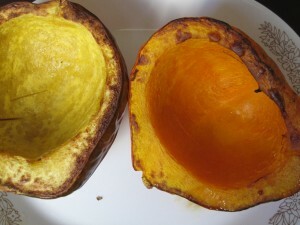 The red kuri squash roasted more quickly than the acorn. While the squash is roasting, prepare the rest of the ingredients. 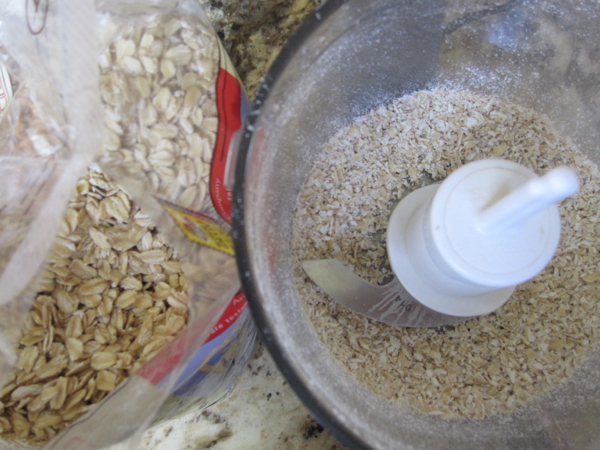 Grind the oats in a food processor until they are a coarse meal. 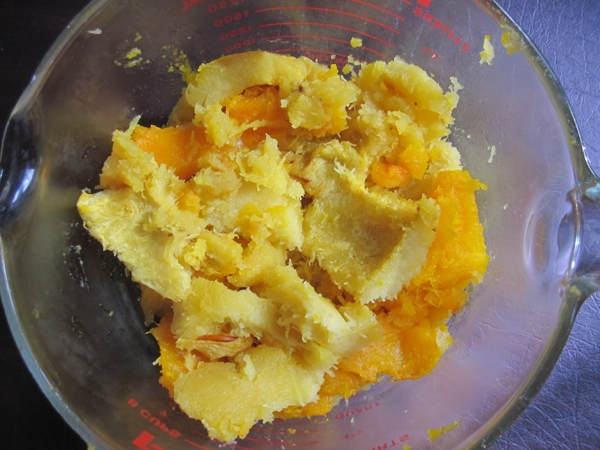 If you will be using the food processor to puree the soup, no need to clean it yet. Heat the olive oil in a large saucepan over medium-low heat. Add the chopped onion, garlic, and 1/4 teaspoon of the salt and cook, stirring occasionally, until the onion is glassy and soft, 6 to 8 minutes. If sauteing the squash (instead of roasting), increase the heat to medium, add the squash, and cook until the pieces shine with a coating of oil, stirring, about 1 minute. Then increase the heat to medium, add the oats, nutmeg, pepper, and pepper flakes and stir until fragrant, about 1 minute. If you roasted the squash, then increase the heat to medium, add the oats, nutmeg, pepper, and pepper flakes and stir until fragrant, about 1 minute. Now add in the roasted squash, the broth, and the remaining 1/2 teaspoon salt and bring to a boil, scraping the bottom of the pan to release any toasted oatmeal bits. Decrease the heat to maintain a simmer, cover, and cook until the squash is tender (if you didn't roast it) about 8 minutes, or just let it simmer for 5 - 8 minutes to meld all the flavors if you did roast it. While the soup simmers, make the spicy yogurt topping. Finely grate the lemon half until you have 1/2 teaspoon zest. Squeeze the fruit to get 1 tablespoon of lemon juice. Add the yogurt, lemon juice, zest, salt, and cayenne to a small serving bowl and beat with a fork until smooth. This can be made up to 3 days ahead of time. To finish, puree the soup with a handheld blender in the saucepan, or in bathces in the food processor (use caution with hot liquids!). If using a food processor, return the mixture to the saucepan and gently rewarm over medium heat until bubbles appear just below the surface, stirring a few times. Add 1/2 teaspoon of the sugar if desired. Taste for salt, pepper, and sugar and adjust. 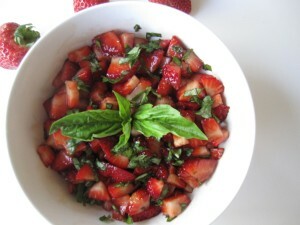 Ladle the soup into deep plates, spoon a generious tablespoon of topping into each, and garnish with parsley. Be sure to swirl the topping into the soup before you dig in. If not eating the soup right away, let it cool a little and store away in the refrigerator for up to 3 days. Maria says you can also freeze the soup for up to 1 month but not the yogurt topping. Maria also suggests the option of using a blue hubbard squash or easily available butternut, which you can find pre-chopped. I also noticed that Whole Foods is now carrying butternut squash puree in cans - this would not be my first choice as a substitute but it might be an option when you are on a very tight time schedule. Love squash and always looking for new ideas, this one was perfect. What great ideas for spanning summer into fall. We’re having the same warm weather here so I have to make my house smell like fall to get in the spirit. This soup should do it! I think I’ll take a whole bowlful and sit down to a delicious lunch. Well there is a reason that I’m paying the high cost of living out here :-). But this soup is wonderful as a big bowl of yumminess with a salad and crusty bread. Stay warm and dry and sated Laura. I don’t have Maria Speck’s cookbook, but I’m fascinated by the subject. Love how you adapted her recipe. Squash soup is so perfect as the weather gets cool. 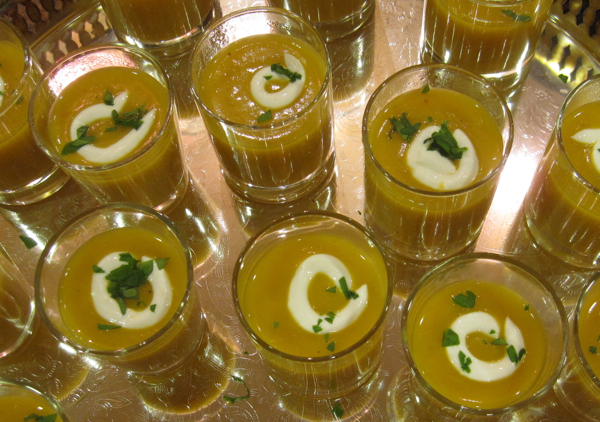 The soup shooters are a great idea for an appetizer / amuse bouche. Nice! Also, the photo of the soup bowl is so lovely and inviting Beth. Don’t you LOVE Cheryl’s book?! Cheryl came to my house this summer and together, we threw ourselves a RIPE Dinner Party. Five courses for 24 people… and it was all wonderful. 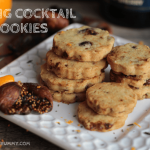 With the arrival of Autumn, I’m LOVING butternut squash in anything I eat. A recent favorite has been a butternut squash puree with an apple-cranberry relish on top. For my next catering gig, I actually plan to serve it in shooters, just like what you did!! I agree it makes for a beautiful presentation. Welcome to my blog Kim! A friend of Andrew’s and Cheryl’s is an instant friend of mine! Yes, I love her book and plan to do some kind of event in my home as well. I love your butternut squash idea – think that one is going on my Thanksgiving menu right now! I also make a vegetarian entree (I posted about it) – a recipe from Melissa Clark with puff pastry that is stuffed with butternut squash, mushrooms, and goat cheese. Usually more takers for that than the turkey! Cheers to you too. Fall finally hit us this week in a BIG way. 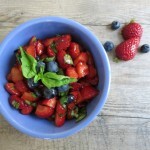 Your photography is stunning and your recipes sound absolutely divine! Love! Thanks Galit! Loved your article last week and glad to “meet you” online. Come back for a nosh and a chat again soon! That makes me smile Gretchen! 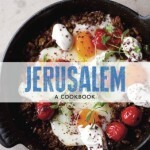 And I will pass on your comment to Maria Speck, the cookbook author as well. Enjoyed chatting with you that evening and hope to cook with you sometime soon! Maybe you’ll come to the cooking class for T’bishvat??? I love this post, Beth! 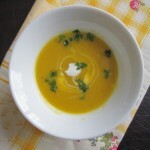 I adore squash soup and am always looking for new ones to try. This one is beautiful!And with oatmeal?? I can’t wait to try it. I’m hosting Thanksgiving this year, so will definitely save this one to serve. Of course, I’ll have to make it before then. 🙂 All of the appetizers you served sound delightful – love your changing seasons theme! Thanks Hannah! We’ll have to menu plan for Thanksgiving together! We always host as well. The oatmeal is a bit of magic. If you don’t already have Maria Speck’s book – I think you would LOVE it! I’m so glad! You can make it ahead to have on Thanksgiving day and to enjoy with leftovers. That’s a great idea! That looks tasty! I’m going to have to “pin” this! 🙂 Stopping by from Sits for Saturday Sharefest! 🙂 Have a great weekend! Happy weekend Stephanie and thanks for stopping by. It is tasty! Pin it but even better, cook it! What a terrific post! Great photos and so full of smart ideas, Beth! Wow, Beth, your whole site has a fresh new look. Nice! 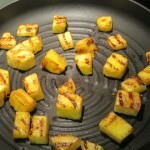 Glad you enjoyed the grilled pineapple from Ripe, and doubly glad you reminded me about Maria’s soup. I’m often so busy preparing the breakfast recipes in her terrific book that I forget about some of the others. Now can you please get rid of this heat? I’m ready for cold. The oatmeal in the soup is such a neat trick and the yogurt topping is lovely. 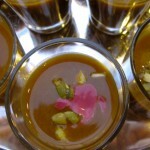 Your carrot soup with the garam masala cream is next on my list.